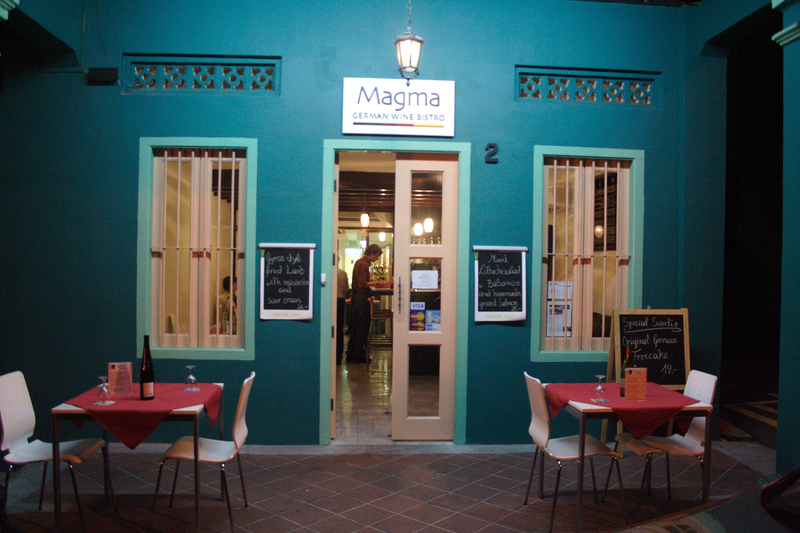 Magma Bistro is participating in Restaurant Week but hey! I went the other day, and it seemed like the menu for Restaurant Week was already up and at the same price! 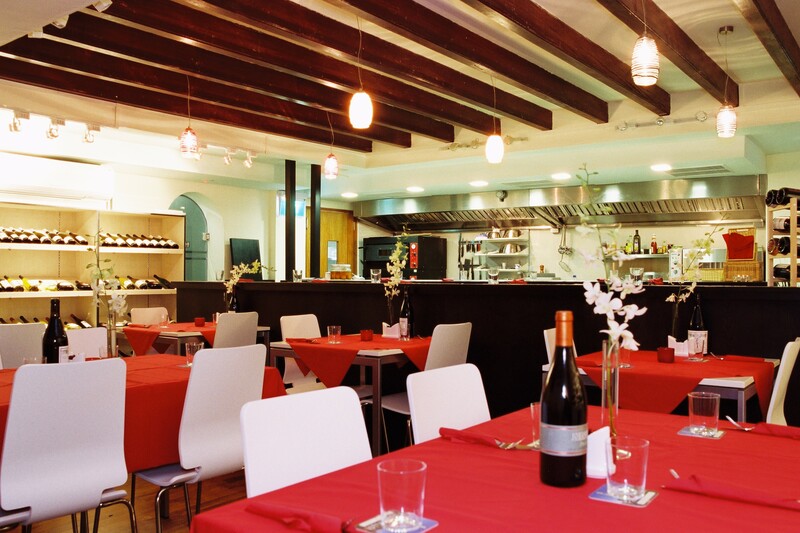 5-course meal for only $39++. Woah, very worth the money plus I like me some fat, juicy German sausages. ;) Saw an angmoh chef, good start! 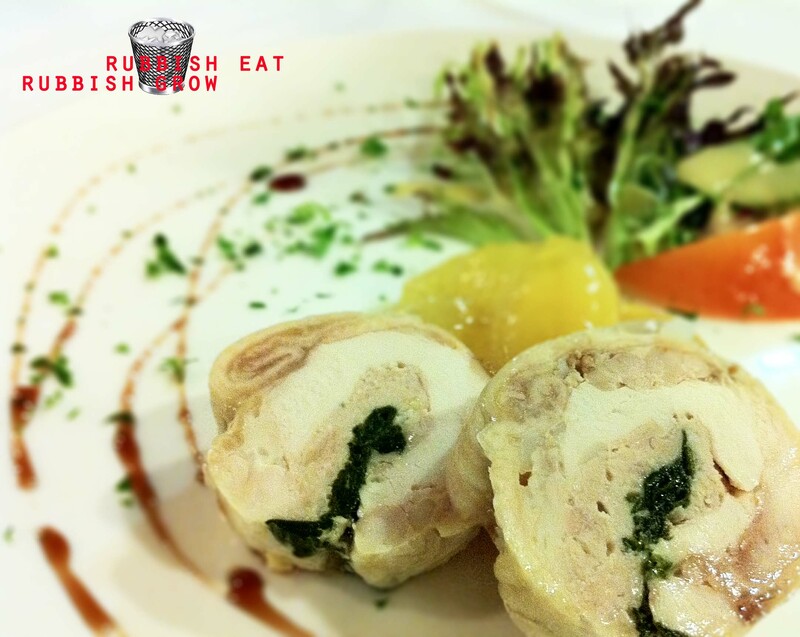 Appetizer: “Chicken-Spinach roulade on Apricote coulis” (I think they spell apricot wrongly). wow, very chim words, catch no ball leh, have to check dickionary. Roulade=roll; coulis, I know, is a fruit sauce. This is a cold dish, kinda like Chinese wedding dish, like hainanese chicken. Because fat people like to eat skin, I ate it. And it was tough… and cold and unappetizing. I wanted to puke. The best thing on this dish is the apricot, which tasted similar to a preserved canned apricot. Cream of mushroom which I’m sure they put in lots of mushroom and lots of cream and only if it wasn’t so salty, I could taste them! 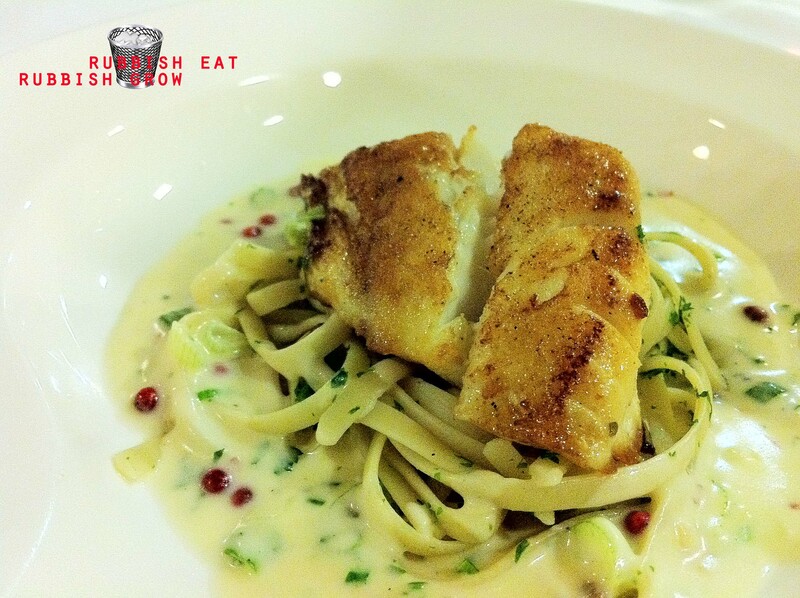 Black cod on herbal noodles and pink pepper sauce. Although the cod was rather fresh, it was slightly undercooked. The pasta tasted very chinese, with so much green onions. I think maybe the training of the angmoh chef is in China? 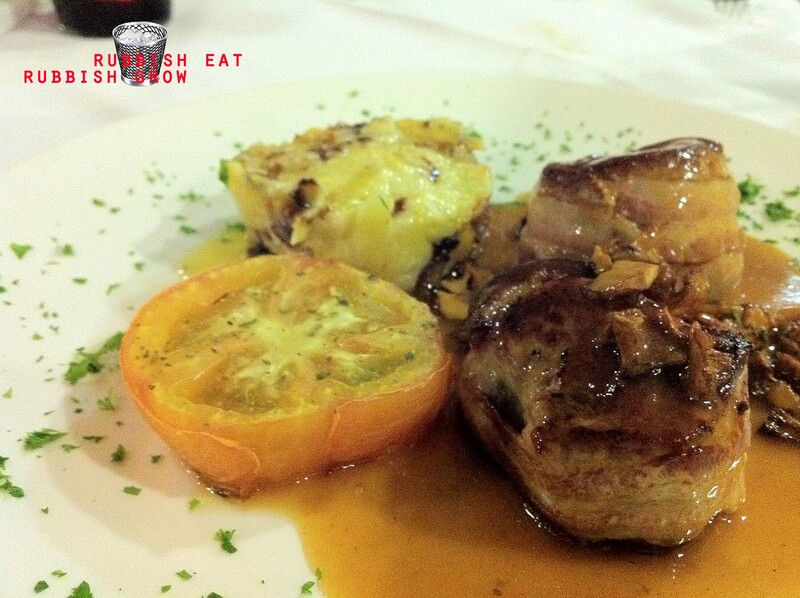 Pork wrapped in bacon in wine sauce with potato-leek gratin and baked tomato. WINE SAUCE. No wonder I like it so much, being an alcohol. But the pork was definitely overcooked and tough. 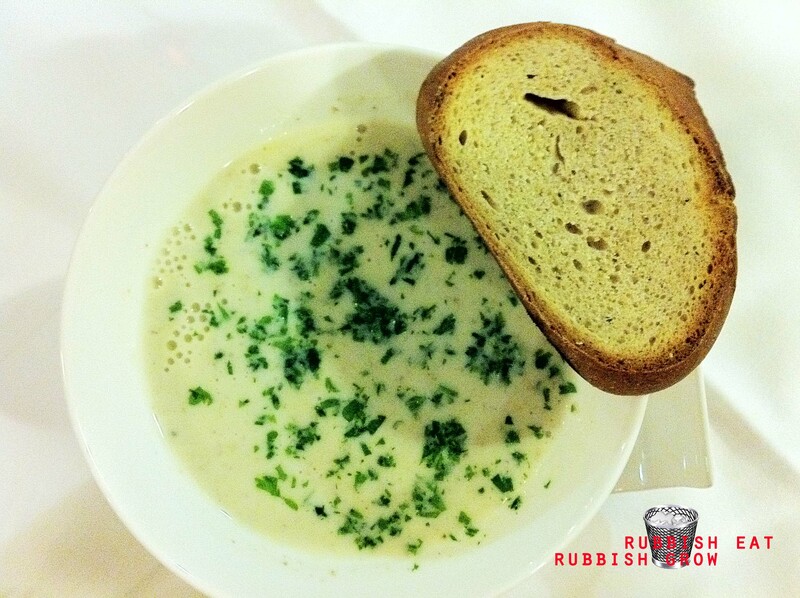 The potato-leek gratin (mashed potato say mashed potato lah) was quite awesome because there was so much cream in it. 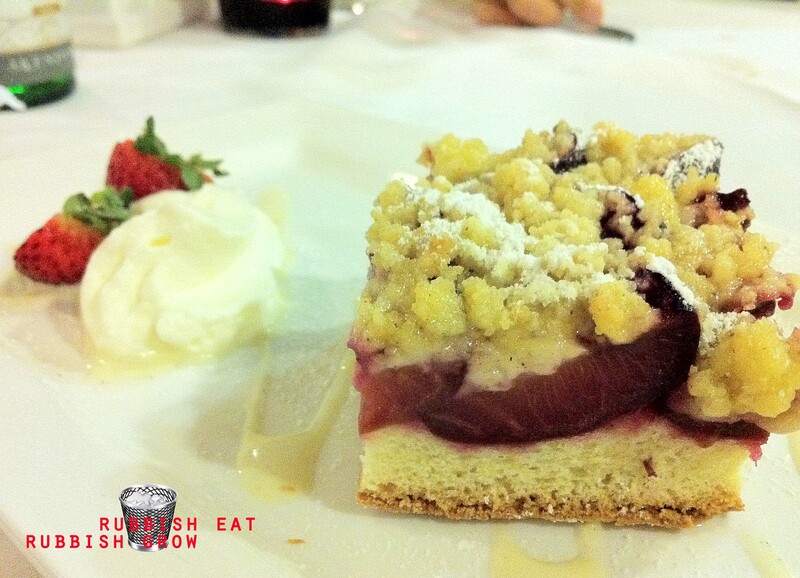 German plum cake. I thought it’s rhubarb at first, with apple crumble on top. It wasn’t sweet at all, and the sponge cake, as typical of German cakes, was hard. At this point of time, my expectations were so low that I actually liked this not-sweet, slightly-sour, hard cake. The fresh cream was amazing: not sweet, and you can actually taste the creaminess and freshness of it but the appearance was very dismal, like it had been through a heavy downpour. Service: Wow, I just read reviews on HGW and it seems like the lady boss is a terror. She made a customer promise NOT to consume the birthday cake on its premises and even took down her details before allowing them to cut the cake. Then they packed the cake and brought it home. Sad. And she even questioned if another customer was breaking Singapore’s immigration laws. What audacity. Tigress, man. RAWR. RESPECT. But my waiter wasn’t too good either. It was as if he took a cue from the lady boss. He was just nonchalant like his job didn’t matter. Even hawkers have better attitude. Ambience: Like a bad imitation, german version of Bistro du Vin but instead of achieving the same homely effect, it feels like Jack Place playing brainwashing German songs. Including a glass of wine ($14), the bill came up to $63 for one person. Yes, I ate alone. Hot, brainy philanthropist-billionaires, feel free to ask me out; even though you’re over-reaching, don’t feel inferior. Thanks. With the nonchalant service, below average food, and unromantic ambience, I wonder how this restaurant could have survived for so long.